This image, taken by NASA's Mars Reconnaissance Orbiter on April 8, 2015, captures the space agency’s Mars rover Curiosity cruising through a valley called "Artist's Drive" on the lower slopes of Mount Sharp. NASA's eagle-eyed Mars Reconnaissance Orbiter (MRO) has captured a view of the space agency's Curiosity rover trundling across the Red Planet. 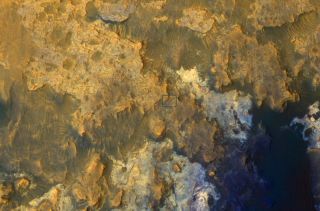 The new MRO photo was taken by the spacecraft's High Resolution Imaging Science Experiment camera (HiRISE) on April 8. It shows the car-size Curiosity rover cruising through a valley called Artist's Drive in the foothills of Mount Sharp. The towering Mount Sharp, which rises 3.4 miles (5.5 kilometers) into the Martian sky, has been Curiosity's main science destination since before the rover's November 2011 launch. Mission team members want the six-wheeled robot to climb up through the mountain's foothills, reading a history of the Red Planet's changing environmental conditions in the rocks as it goes. Curiosity touched down inside Mars' Gale Crater in August 2012, then spent its first year exploring the area near its landing site for signs that the planet could once have supported microbial life. The rover found plenty of such evidence, and mission scientists determined that Gale Crater harbored a habitable lake-and-stream system billions of years ago. Curiosity departed for Mount Sharp in July 2013 and reached an outcrop at the mountain's base called Pahrump Hills in September 2014. The rover recently left Pahrump Hills and has been making its way, via Artist's Drive, to a science destination dubbed Logan Pass. Logan Pass is visible at the bottom left of the new image, which covers an area about 550 yards (500 meters) wide, NASA officials said. Curiosity's odometer recently ticked past 10 kilometers (6.21 miles) on the Red Planet. But Curiosity isn't the Mars distance-driving champion; NASA's Opportunity rover, which landed in January 2004, achieved the marathon milestone of 26.219 miles (42.195 km) in late March. Opportunity holds the off-world driving record. Second place belongs to the Soviet Union's Lunokhod 2 rover, which traveled 24.2 miles (39 km) on the moon in 1973.